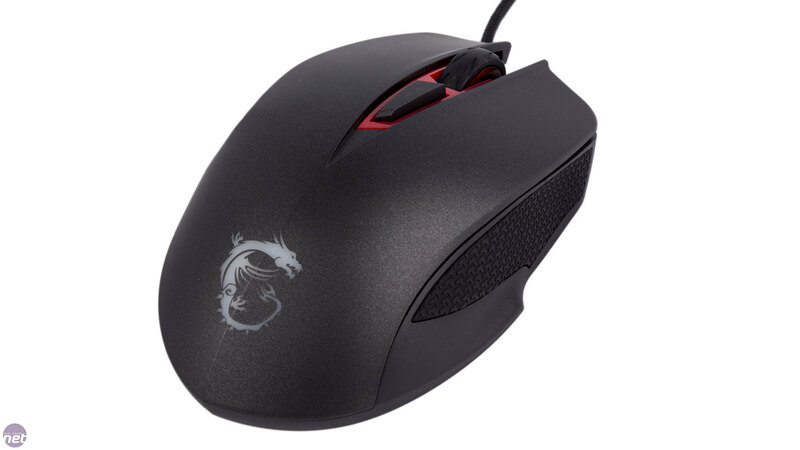 MSI is not a big name when it comes to peripherals, but as the PC gaming sector continues to grow it's no surprise to see new and renewed interest in keyboards and mice from many familiar industry names. 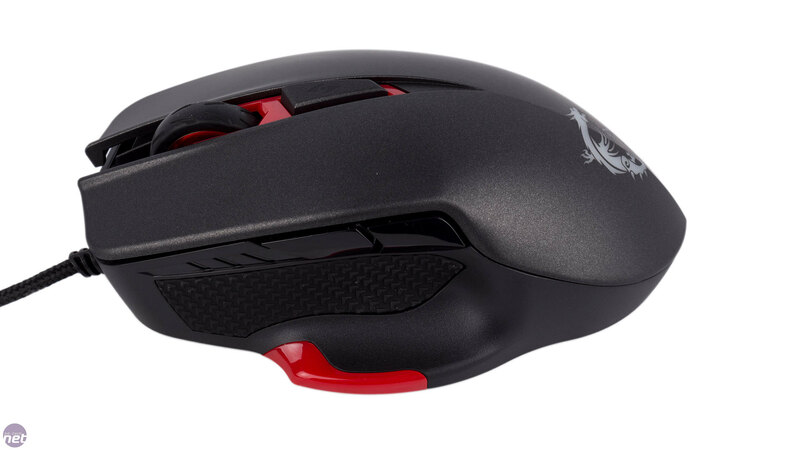 Up for evaluation today is the company's new Interceptor DS300, a six-button rodent sporting adjustable weights and an 8,200 DPI laser sensor. Build quality and comfort are strong points for the DS300. 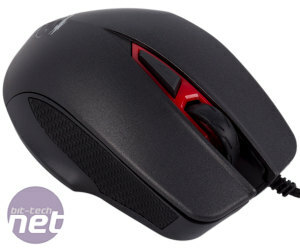 Like the Asus ROG Gladius, it has a long, full body with a right-handed ergonomic design that's well moulded. It lacks obvious contours and grooves for fingers, but they find their positions quickly and naturally nonetheless. 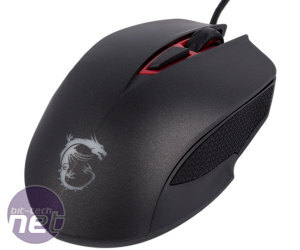 The whole mouse is very solid with no wobbly buttons. 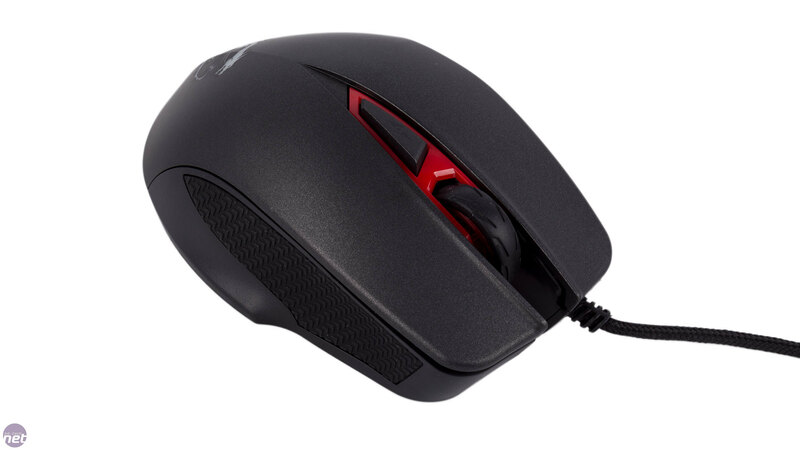 Though the smooth plastic body is not soft-touch it's still comfortable to wield, and the thumb rest and textured, rubber side grips give you a firm grasp of the unit, while the latter also keep your pinky elevated. Four PTFE feet keep movements silky smooth and the braided, gold-plated cable, while not detachable, is secured in such a way as to stop it dragging on your gaming surface. 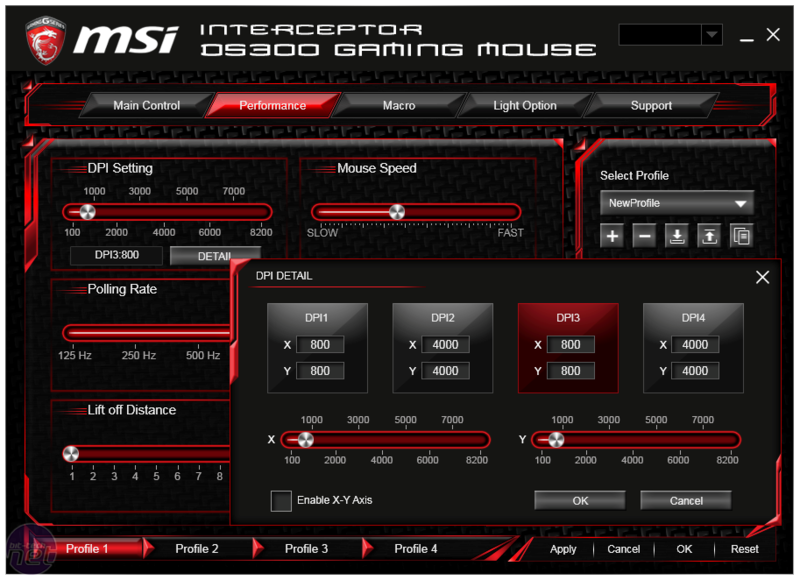 The Interceptor DS300 is a heavy mouse at 153g, and that's before you add any of the three 4.5g weights to it. These slot in easily to their receptacles, which are arranged in such a way that you can use one or two to deliberately weight the mouse to one side instead of just keeping it centred. 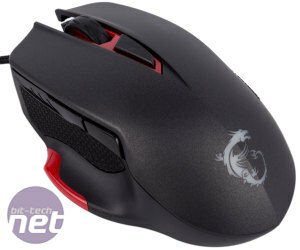 MSI utilises Omron switches beneath the two main buttons, though they feel heavier than usual. 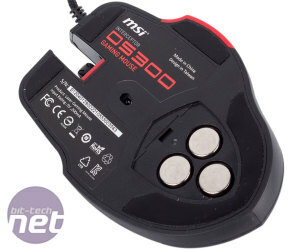 This is perhaps due to a heavier switch type (we're waiting for MSI to confirm exactly what switch) but may be also down to the length of the mouse leaving our fingers a little further back from the tip of the buttons than we're used to. Either way, the action itself still satisfies. 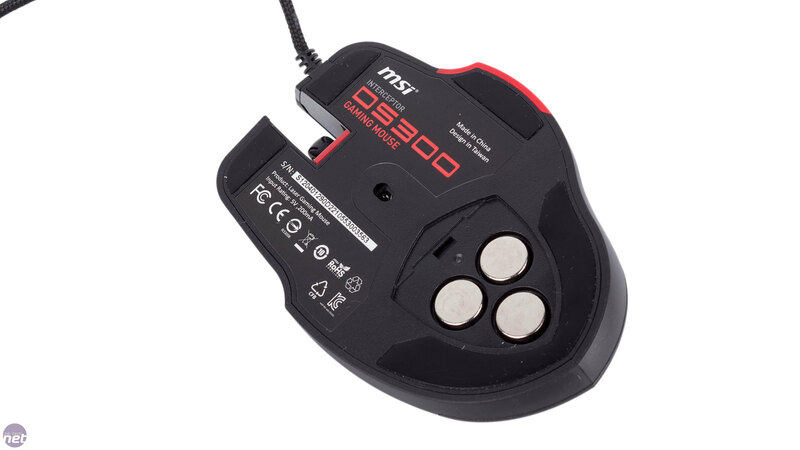 It's down to preference really, and given the weight of the mouse we'd say the DS300 is more suited to games that require more deliberate control (sniping and vehicle roles come to mind) than twitch shooters or MOBAs. The remaining switches are all on the heavy side too. This didn't bother us with the DPI toggle or scroll wheel – in fact, the wheel is awesome, with a stable rubber surface and clear, notched feedback. However, we do wish the thumb buttons were lighter as they're handy both in daily desktop use and also for in-game commands that need rapid access. 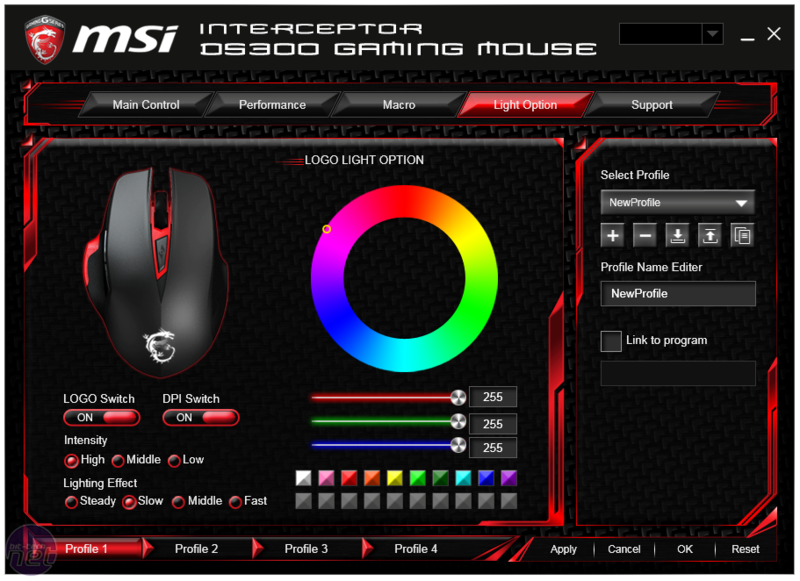 The DPI toggle switches through the DPI levels, represented by three LED indicators in front of the thumb buttons. They're easy to see, but it would have been clearer and more intuitive to use a four LED system, given that that's how many DPI stages there are. 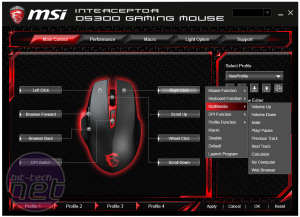 The dedicated software package lets you customise the mouse's four profiles. These are stored onboard, so your DPI settings, custom commands (including macros) and lighting configurations can easily be taken with you. 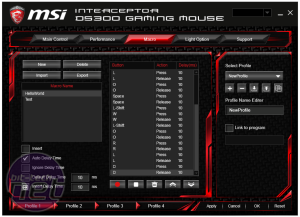 That said, if you want to utilise the application-based auto-switching or the profile and DPI OSD indicators, you'll need the software running. 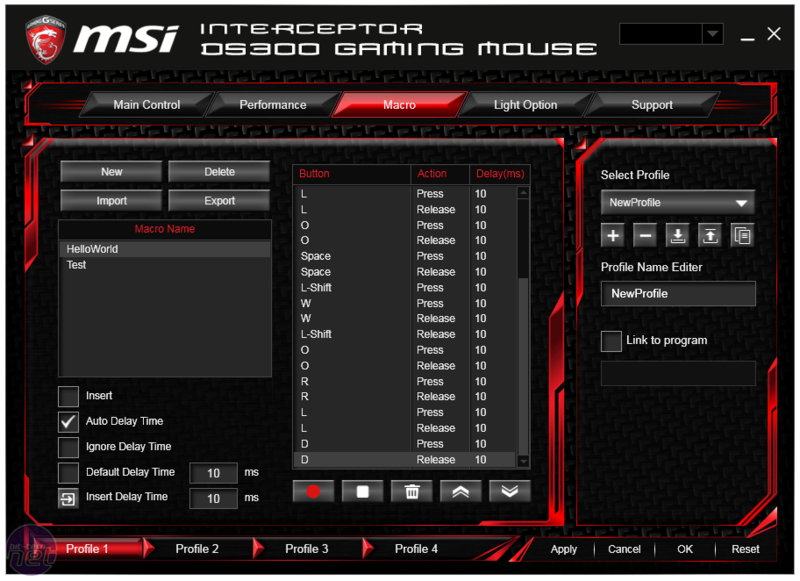 Despite some minor teething bugs, the software is well laid out and easy to use. 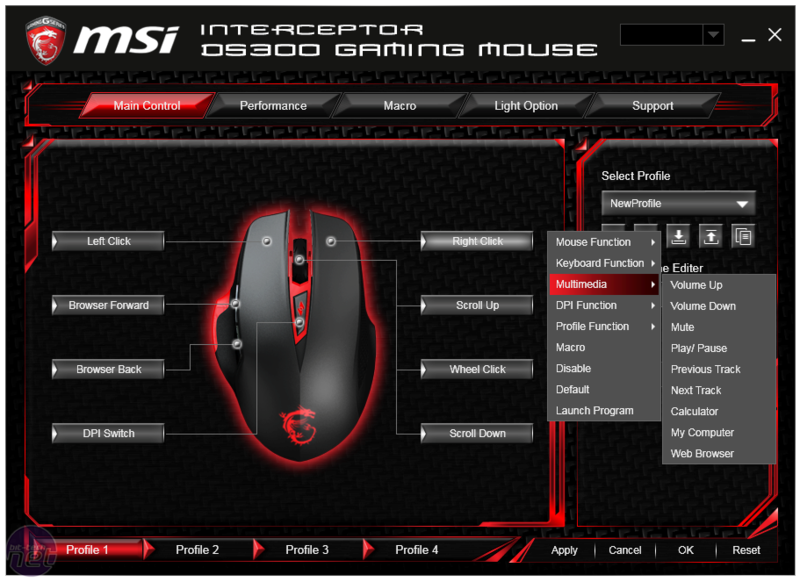 The button configurator, which lets you reprogram all eight commands (including scroll up/down) has plenty of functions to pick from, though one that's missing is a DPI clutch/sniper mode command. Similarly, the macro editor is powerful and intuitive, with all the usual delay options, though when it comes to playback it's missing the play while held option. The Performance tab lets you tweak each DPI stage in 50 DPI increments, though you can't disable them if you only want to use three or four. X/Y axis separation is available for anyone who hates themselves, as well as various other settings like polling rate and lift-off distance. 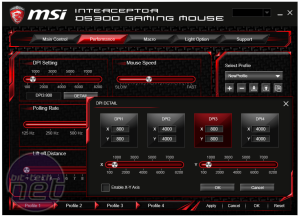 The 8,200 DPI sensor is the Avago ADNS-9800, which is fairly well established among gaming mice now. At the lowest lift-off distance setting, the mouse wouldn't even track with one CD between it and the surface – a very good result. At the highest setting, this increases to somewhere between two and three CDs, so there's a decent amount of variation for anyone who needs it. As for tracking itself, we can't say we experienced any issues – basic acceleration tests revealed nothing to be concerned about, while there's no angle snapping and jitter was only evident at crazy high DPI levels (i.e. above 6,000 DPI or so). General performance in Photoshop and across a small selection of games was fine – we'd be happy using this sensor on a daily basis, essentially. 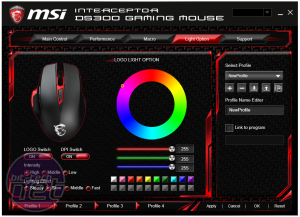 The DPI toggle has a red LED beneath it while the logo has full RGB lighting, controlled with a simple colour wheel and RGB sliders in the software. They can be disabled independently, and the quality is high – the logo has a very even backlight and whites look good too. There's nothing outstanding about the DS300, but it does plenty right and has very few flaws. 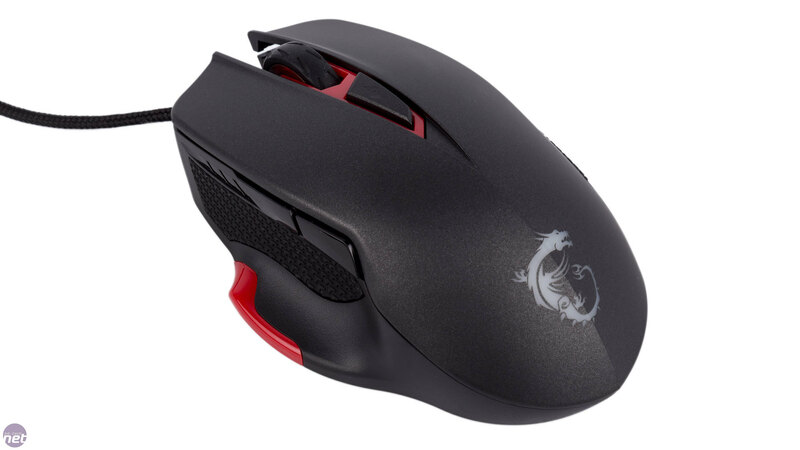 It's definitely on the large and heavy side, both in terms of physical weight and button actuation, so it's more suitable for some players and games than others, but that's true of literally every mouse. The MSRP is subject to change before the launch (depending on the dollar value), but it shouldn't be far off the £40 mark. This is a competitive price point with plenty of good options, and the DS300 has safely added itself to that list – recommended if it suits your style.